Foreword by:Walter Luh, Creator of Corona SDK. Contact sales@BurtonsMediaGroup.com for volume purchases. NOTE: This book is also available on Amazon, Kobo, and Apple’s iBookstore. Due to Amazon & Kobo pricing policy it was necessary to break this book into three parts. Each part is available individually for $9.99 USD. Version 1.07- Corrected some formatting issues with ePub & mobi editions. Version 1.5 – MAJOR UPDATE: Updates to: Pedagogy & clarity improved throughout the textbook; Update to Widgets chapter to Widgets 2.0; Updates due to API changes; Update to new Sprite API. New Content: How to add Custom Fonts; New Chapter on System Events, GPS, Accelerometer, Compass, and other system tools; New example on working with JSON Files. ZOMG can’t wait for the book! I’m ready to buy it and slap it on my ipad!! w00t! super, I want this book too, where can i buy this book? The early release should be available by July 29. It will initially only be available through my website. This is what I have been looking for!!! When and how can I get a e-copy of the book? Finding a few typos’s, just wondering where you’d like to post them. . .
Can you tell me how many chapters are currently included in this early release? If I purchase now, I am interested in some of the later chapters. I want to see if they are included, even if only in first draft form. Thanks! Hi, I purchased your Early Release PDF eBook and was wondering when you’re expecting to release the final version for it? The final version should be available within the next few weeks. I am currently finishing chapter 15, and have just chapter 16 to finish writing. I just downloaded the early release and wondered if there was a “mobi” version that I can read on my Kindle? The description stated that it would be available in ePub, mobi & pdf? The mobi and ePub versions will be available shortly after I finish the final chapter. I’m making progress, should be soon! If I purchase the early release of the book how will I receive the final version (via email)? Also, I am mainly interested in developing a database-centric application using Corona. Will you be covering this topic in detail in your book? Hi Dr., congratulations for the book. I wanna translate your book to Portuguese, because doesn’t exists a Corona book in my country or language. Do you have any interest in this? Yes, I will be sending out an email to all early adopters as soon as the book is finished. You will get the update for free and continue to receive updates even after the book is finalized. Chapter 12 has a full database project using SQLite included and explained. I also include examples of apps with databases in other chapters as well. I will send you an email. Thank you for the interest! Are you covering gestures like pinch to zoom, drag, tap, etc? I mention all of them, but I have specific programming demonstrations of drag and tap in several apps. When will the mobi version of this book be released? If you are an early adopter, the mobi version will be made available as soon as the book becomes final (which will be very soon for the Mobile App Development book, the end of February for the Beginning Mobile App Development book. I will also be making Mobile App Development available in parts (Ch 1-6, 7-12, & 13-Appendices) through the Amazon Kindle program as soon as it is completed. Hello, I’m Andrea from Italy. I’d like a copy of the ebook possible the complete version. How can I buy it? thanks for the attention. You can purchase the book by clicking on the Books tab at the top of the webpage. Thank you for your interest! How can I buy the Print book? Thus far there hasn’t been enough of a demand for a paper version to make printing cost effective. If you would like to be put on the list for a print copy, please send me an email and I will add your name to the notification list when it becomes available. I bought this book in 3 sections on Amazon, didn’t realize I could buy it from here and get the free updates. Do’h! No problem! As I update the book, Amazon will notify you that it has been updated. All updates will continue to be free no matter where you purchased it. Firstly I’d like to say great work on the book. I purchased it a few months back and have enjoyed reading and referring to it while getting to grips with Corona. I spend more of my time working with Corona offline, so have found it helps as an offline reference tool. I have also been pleased with getting updates on the lead up to the final release and it’s been a positive experience buying an eBook early. They range from star fields, to Mandelbrot sets, and even 3D. The full source is available for download of each samples via my site. The two I am most pleased with are the Texturemapped Raycasting Engine and the 3D Object renderer. These two push Corona past what it’s really designed for, but I think more can be achieved with some time (and possibly extended support in future from Ansca with their API). I wanted to show you these two in case you considered doing an update to your book at some point, and are interested in showing just what can be done with Corona. I have shared these examples on the Ansca site via their forums and code share pages in the hope it will push others to think outside the square and make some cool things. If you have any questions, or comments please let me know. You can reach me via my site (or my gmail account – used to sign up here – I check this more frequently). This is some really good stuff! Yes, I will be speaking with you about what you have done before I start the next book on Corona! When will the book ,Mobile App Development, be available in Apple iBooks store? It is just waiting on Apple’s approval process to be completed. Should be available very soon! What is difference between this book and the your “Mobile App Development with Corona: Getting Started – Part 1, 2 and 3” in Amazon? There is no difference between what is for sale on Amazon and what I have available on my website beyond the Amazon version is broken into 3 part because of how they do royalties. 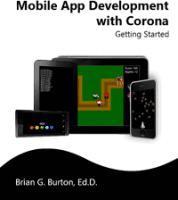 Do you have plans to launch video lessons, rather than just books on the Corona? Thank you. I’ll be buying these books soon. Yes! Thank you for asking! I hope to have the first video/online classes ready by this summer. What is difference between the book “Mobile App Development with Corona” and “Beginning Mobile App Development with Corona”? The summary appear equals.